This blog was originally posted on EDF’s Climate 411 blog. Yet another study is confirming what we’ve known for quite some time — the benefits of EPA’s clean air rules vastly outweigh the costs. An analysis from the Economic Policy Institute (EPI) reinforces what other studies have told us time and time again: clean air is a great economic investment. Unfortunately, that fact is often lost in the unfounded attacks on EPA that have gotten so much attention lately, in the media and even in Congress. 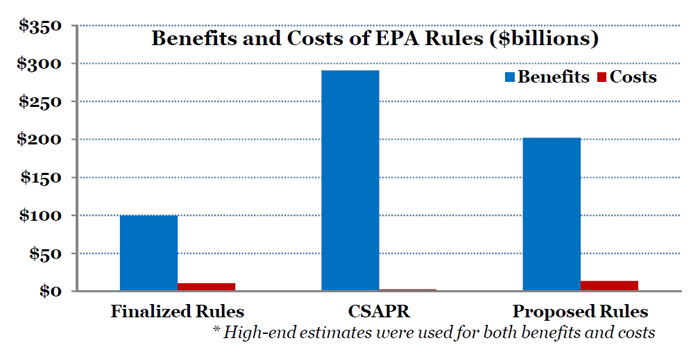 The dollar value of the benefits of the major rules finalized or proposed by the EPA so far during the Obama administration exceeds the rules’ costs by an exceptionally wide margin. Health benefits in terms of lives saved and illnesses avoided will be enormous. Of course, the most important benefits of clean air are those related to human health. Just three of these rules (Cross-State Air Pollution (CSAPR), Mercury and Air Toxics, and Boiler MACT) are estimated to save up to 57,500 lives a year. Setting aside CSAPR, the combined annual benefits from all final major rules exceed their costs by $10 billion to $95 billion a year. The estimated benefit-to-cost ratios for those final rules range from 2-to-1 to 20-to-1. The net benefits from CSAPR range from $112 billion to $289 billion a year. EPI has also shown, in a previous analysis, that EPA clean air rules can also have a positive impact on overall employment – including 28,000 to 158,000 jobs from the Mercury and Air Toxics rule for power plants alone. Calls to delay implementation of the rule based on vague appeals to wider economic weakness have the case entirely backward – there is no better time than now, from a job-creation perspective, to move forward with these rules. It’s time for everyone – and especially Congress — to recognize that EPA rules are not only good for our health, but also our economy. This entry was posted in Clean Air Act, Politics. Bookmark the permalink. Post a comment or leave a trackback: Trackback URL.